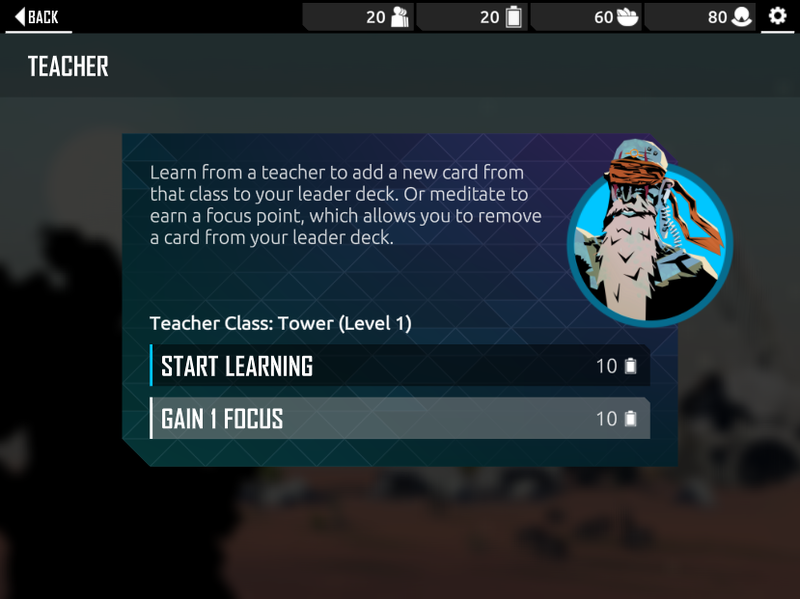 In Nowhere Prophet you have two very different decks: The Convoy Deck and the Leader Deck. The convoy deck is very flexible. You can add or remove people at any time. This means it can react quickly and that also means it's something you can fiddle with a lot. Counter to that is the leader deck. This is a lot more static. For one because I wanted the improvement of your leader to feel different than when you improve your convoy deck. Plus having both decks be super fiddly would make you feel like you HAD to fiddle with them a lot more than you do. So, instead the leader deck grows and changes slowly. Whenever you level up you get a card to add to the deck. Starting at 12 cards and going up to 10 levels will have you end up at 22 cards (not counting equipment). 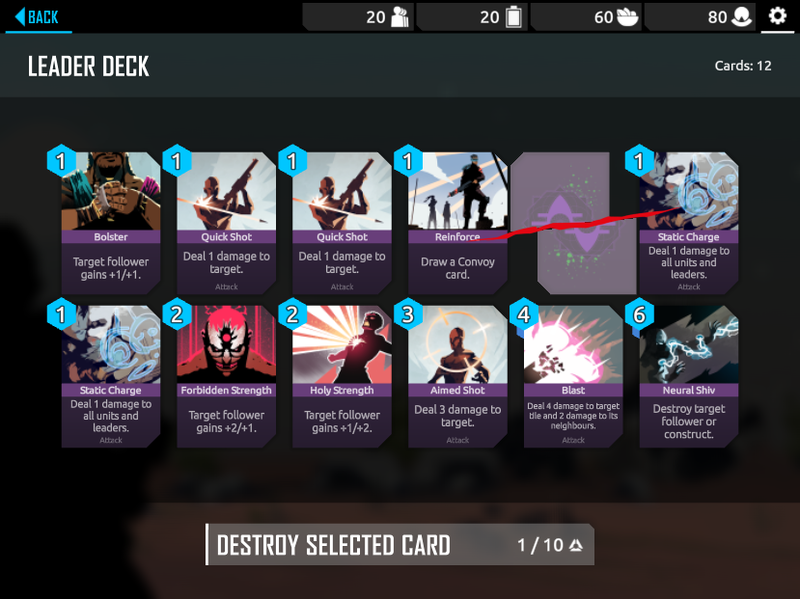 Now simply adding cards would be fine, but if you want to keep your deck slim and effective you'll need to strip out cards now and again. The smaller your deck is, the more control you have over the luck of the draw. There's a reason most people playing TCGs competitively have decks at the minimum deck size. So I knew that the mechanic to remove cards from the leader deck was needed. But back when I added it I didn't have a great way to tie it into the game, so I simply made it so that you could always forget a card when you wanted, but it would cost your leader some health. That made it so you could always trim your deck (up to a minimum size of 6 cards). However oddly enough this also was built in a way to stay relatively hidden. It was in a sub-menu of the leader that not a lot of people seemed to open. And the solution was to add FOCUS POINTS. You can spend one of these to "focus" your deck by removing a card. And this is a resource you gain whenever you level up. So basically it means that for every card you add, you get to remove one allowing you to stay at 12 cards - if you want to. It solves issue 1 by adding a limited resource, instead of using the leader's health which you can regain through resting and food. And it solves issue 2 by adding the animation you can see above after levelling up (plus a tutorial step) when you do this for the first time. This animation shows the new resource, which is also re-used in the Leader overview screen, hopefully luring people to give it a try. Now, besides allowing your to learn a card you can visit a teacher to forget a card instead. This makes teachers more valuable if you want to be very efficient and it points out the feature again.